Skytron’s Tandem Mount Carrier Arms with flat screen features two dual arm sets from a single ceiling-mounted hub. Contact us today for your quote. 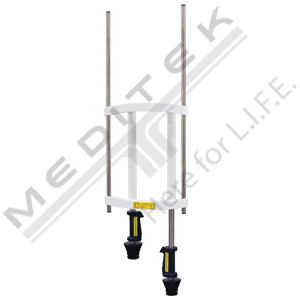 The Skytron tandem mount carrier arms upper arm set is designed to support a carrier while the lower arm set can hold up to two flat screen displays. This configuration is ideal for added accessibility to equipment, medical gases and utilities without sacrificing the space and coverage you require. This Skytron-exclusive design reduces construction costs by using only one mounting structure. All models are available as either standard or heavy-duty. 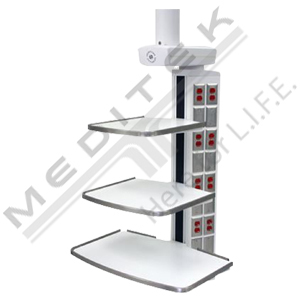 415-0000-0060 ET2F_/2AF_: Tandem system with two arm sets on one hub Fixed height (61"/31.5") 51"/35.5" Flatscreen mounting bracket & power cord(s) required (priced separately). 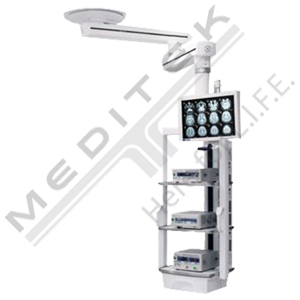 415-0000-0057 ET2E_/2AF_: Tandem system with two arm sets on one hub Powered height (61"/31.5") 51"/35.5" Flatscreen mounting bracket & power cord(s) required (priced separately). 415-0000-0062 ET2S_/2AF_: Tandem system with two arm sets on one hub Manual height (61"/31.5") 51"/35.5" UB, VB or FC3 carriers only. Flatscreen mounting bracket & power cord(s) required (priced separately). 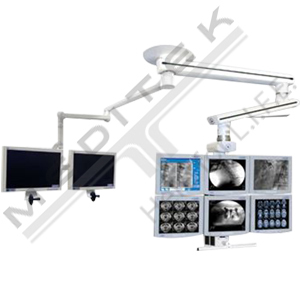 415-0000-0061 ET2F-C_/2AF_: Heavy Duty tandem system with two arm sets on one hub Fixed height (51"/31.5") 41.5"/35.5" Flatscreen mounting bracket & power cord(s) required (priced separately). 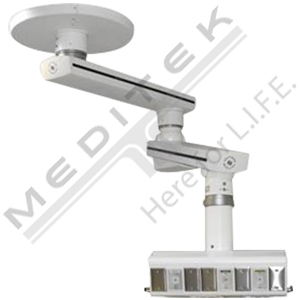 415-0000-0058 ET2E-C_/2AF_: Heavy Duty tandem system with two arm sets on one hub Powered height (51"/31.5") 41.5"/35.5" Flatscreen mounting bracket & power cord(s) required (priced separately). 415-0000-0063 ET2S-C_/2AF_: Heavy Duty tandem system with two arm sets on one hub Manual height (51"/31.5") 41.5"/35.5" UB, VB or FC3 carriers only. Flatscreen mounting bracket & power cord(s) required (priced separately).